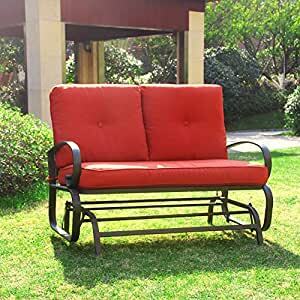 Enjoy the beautiful weather with your friends by relaxing on this glider bench. Have a seat on this comfortable swing chair and let the breeze gently sway your back and forth. The seats have an incredibly comfortable seating angle and each side has a swing arm. This item is easy to assemble and low-maintenance. You get the best price because they are directly from manufactory. Assembled Product Dimensions (L x W x H) 47.00 x 31.50 x 33.50 Inches. All customers receive our Expert Guide about Home Improvements from AVA Furniture.